Recommended Name: � the Later Tyrol pattern. According to examples known to the writer, this pattern emerged c.1850 in Innsbruck and spread out in the Habsburg crownland of the Tyrol (including the Italian-language Trentino) via Bozen/Bolzano and Trento/Trient. From 1870 it was obviously the stronger competitor of the Older Tyrol pattern [IPCS #45], an offspring of the Old Bavarian pattern. The Later Tyrol pattern was in play until c.1900, having from c.1860 been gradually usurped by a Bavarian pattern made in Innsbruck and later by the Salzburg and Tell patterns. The Later Tyrol pattern retains the main specifics of the Older Tyrol pattern, i.e. the Ober of Acorns holding aloft a sickle and the Unter of Acorns waving a flower in his hand, among the other Old Bavarian martial figures, but shows radically changed scenes on the Daus cards: a milkmaid on Hearts, a travelling couple with handcart on Leaves, a farmhand and lass with oxen in a field on Bells, and two people with a heavily-packed horse on Acorns. The scenes on the numerals remain almost the same ones as for the Older Tyrol pattern, but the Unter of Acorns with the flower in one hand usually gets the 'Old Bavarian' sword back to the other. Such a radical break with Daus tradition is hardly understandable from a traditional cardmaker. Indeed, the earliest pack known to the writer with the Later Tyrol pattern stems from a 'side-entry', a lithographer from Innsbruck named Joseph Schöpf, who worked there from 1841 to 1861. From the early 1850s and almost certainly by the maker Franz Krapf of Bozen stems a Later Tyrol pattern pack which shows the oldest-known inscription WELLI on the 6 of Bells. The name most probably derives from the Italian Il Bello (the beautiful), and indeed it is, as the WELLI card shows an additional Acorn and Heart suit sign. 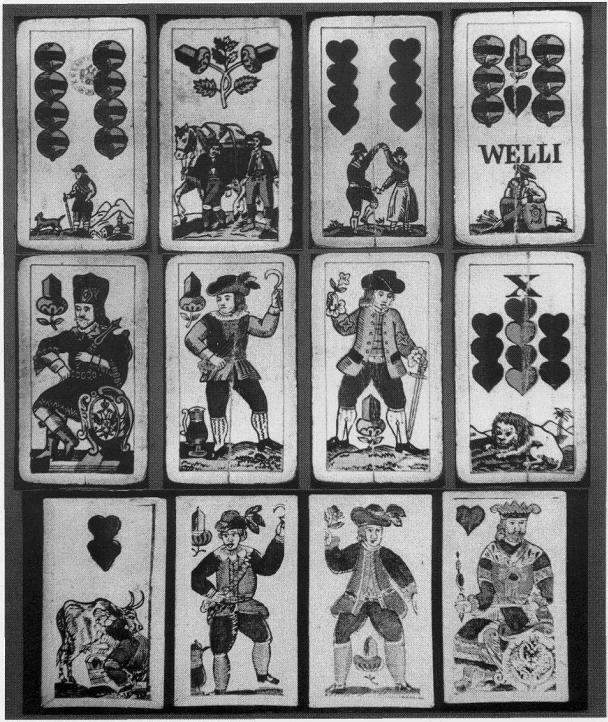 Functionally, the WELLI represents a predecessor of the Joker, in that it can be declared as having another specific card's value in playing games invented in the bilingual area directly south of Bozen/Bolzano, namely 'Bieten' (bidding), 'Perlaggen' (derives from Italian 'Perlicco-Perlacco' a magic formula like abracadabra), and 'Watten' (derives from Italian 'battere', battling). Obviously the name WELLI wandered c.1855 to a pack made in Salzburg, omitting thereby one 'L'. Since then, the inscription WELI can be seen on the 6 of Bells on most Salzburg- and Austrian-made Tell-pattern packs, and in a few cases also on Linz ('wheel-pusher') - and Lemberg ('Moors') - packs. 32 cards: 4 suits of 8 cards, comprising Daus, King, Ober, Unter, X to 7; 36 cards (more frequent): additionally the 6s in the four suits, the 6 of Bells in most cases with the inscription WELLI. Innsbruck: Joseph Schöpf, c.1850; Joseph Fasser,1876 - c.1895; Wilhelm Graf, c.l880; F.J.Fasser, c.1892. Bozen: Franz Krapf, c.1850, c.1855; Karl Albrecht, 1858-c.1885. Wien: Ferdinand Piatnik & Söhne, c.1900. ALL CARDS ON THE TABLE by Sylvia Mann; Leinfelden-Echterdingen and Marburg, 1990. THE TYROL PATTERN by Peter Blaas (IN) The Playing-Card (Journal of the I.P.C.S.) XXI/1, 1992. KARTENSPIEL IN ALT-TIROL / CARD GAMES AND CARDMAKERS IN THE OLD TYROL (bilingual) by Peter Blaas (IN) TIROL - immer einen Urlaub wert, Winter 1992/1993, Innsbruck. TIROLER SPIELKARTEN IM 19. JAHRHUNDERT by Peter Blaas, (IN) Spielkartenangebot XIV, 10.89, MGM Münzgalerie München. LOS NAIPES..., catalogue by Felix Alfaro Fournier, Vitoria, 1982. (Above) from a 36-card pack by Josef Fasser, Innsbruck c.1885.